I was quite surprised to learn this story while tracing the ancestry of my grandmother, Virginia Doughty Hughes (1896-1978). In 1804, my grandmother’s direct line Doughty ancestors lived in the western part of the Pendleton District in South Carolina. The eldest was Joseph Doughty (1755-1815), who was my 4th great grandfather. His children included my 3rd great grandfather, Jeremiah Doughty Sr. (1777-1838) and Jeremiah’s older brother, Daniel. 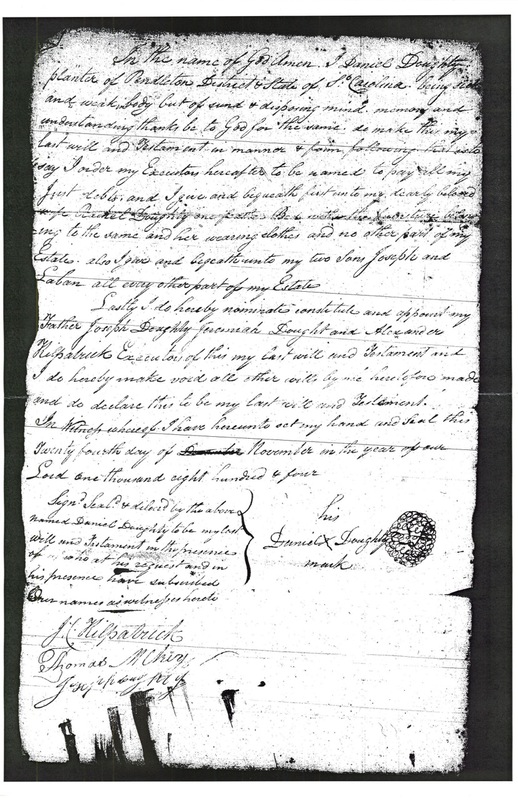 Daniel Doughty’s will, dated Nov. 24th, 1804. Towards the end of November 1804, Daniel filed a will saying that he was “sick and weak in body but of sound & disposing mind memory and understanding.” In the will he bequeathed “unto my dearly beloved wife Rachel Doughty one feather Bed with the furniture belonging to the same and her wearing clothes and no other part of my Estates.” He left the rest of his estate to his sons, Joseph and Laban. By the following February, Daniel was dead and his “dearly beloved wife” was in jail, accused of murdering him. A second suspect named John Andrews was also in jail but the alleged mastermind of the crime — Rachel’s father, Laban Oakley — had escaped from jail and was on the run. in Chief in & over the State aforesaid. on his being convicted of the said offence. of State. Recorded 19th February 1805. 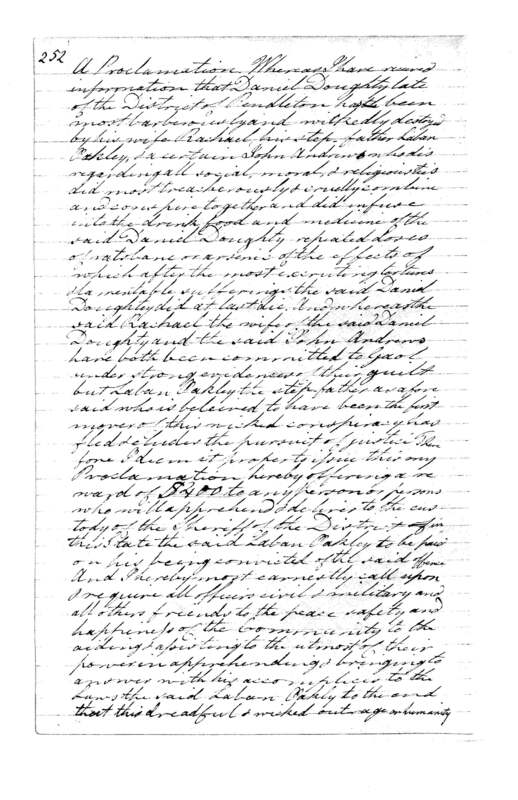 According to sources I found online, Daniel Doughty the younger (the murdered Daniel’s son) later changed the spelling of his last name to “Doty.” Why he did this, I don’t know, but it may have been an attempt on his part to stake a claim of descent from the Mayflower passenger Edward Doty. He ultimately settled in Mississippi, where some say the community of Doty Springs was named after him. I wonder if the name Dougherty (Doherty) is the same as Doughty. The Dougherty family lived not too far from the Hughes family in the Hawfields in the late 18th and early 19th centuries. Mark, I don’t have any evidence linking my Doughty ancestors to Dougherty or Doherty. However, there are some who believe that immigrants from Ireland named “Dougherty” changed their names to “Doughty” after they arrived in the U.S. See http://homepage.ntlworld.com/kdoughty/doty.html. I don’t know yet, Glenn, but I’m hoping to find out. I also would be most interested in what happened to the murderers. Joseph Sr ((1755-1815) is my 5GG father. Joseph Jr (1783 – 1848) my 4GG father.I did a quick search and found nothing – not even a trial. Somebody told me that the murderers were hanged, but I have not found any record of that myself. Thanks for this info, Gary. I am a member of the Doty/Doughty DNA Project, and I have several autosomal matches named Doughty or Doty. Silly question but have you made the connection to Edward Doty? David the elder was the great grandson of Edward, the Mayflower passenger. Edward is my 9x great grandfather. I had traced some information on Daniel the elder but hadn’t gone into great detail as my line branches off from who would have been his uncle Benjamin Doty. This story is fascinating and I am so glad I accidentally landed here! Thank you for sharing it. I would love to find “the rest of the story” in relation to the fates of the murderers! Hi Jeanie, thanks for your comment. I believe that my grandmother’s Doughty line is descended from Edward Doty, but I don’t have documentation good enough to prove it. As for the people responsible for the murder, I have heard that they were all hanged, but I don’t have documentation for that, either.